10 February 1910-2 August 1914: Fahnenjunker in 2. Lothringisches (Festungs-) Pionier-Bataillon Nr.20. 8 October 1910-1 July 1911: Detached to the War School in Engers. 2 August 1914-7 August 1915: In the Field as Platoon Leader in Pioneer Regiment 20. 7 August 1915-11 September 1915: Adjutant of the I. Battalion of Pioneer Battalion 20. 11 September 1915-7 December 1917: Leader of the 165th Mortar Company. 7 December 1917-10 October 1918: Leader of the School Teaching Company at the Army Mortar School in Valenciennes. 10 October 1918-22 December 1918: Company Chief in Pioneer Battalion 185. 22 December 1918-9 August 1919: Delegated with the leadership of Pioneer Battalion 4 and delegated with the setting up of Mortar School East Army. 9 August 1919-1 October 1919: Transferred to the 15th Reichswehr Mortar Battery. 1 October 1919-28 April 1920: Chief of the 15th Mortar Battery. 28 April 1920-16 May 1920: Teacher at Infantry School, II. Course, Wünsdorf. 16 May 1920-1 October 1921: Transferred to Infantry Regiment 9, while retaining his previous command. 1 October 1921-1 February 1925: Company Chief in Infantry Regiment 13. 1 February 1925-1 April 1926: Detached to the Inspectorate of Weapons and Equipment, Reich Defence Ministry. 1 April 1926-1 November 1926: Transferred to Cavalry Regiment 3 and detached as Expert to the Inspectorate of Weapons and Equipment, Reich Defence Ministry. 1 November 1926-1 October 1931: Transferred as Expert to the Inspectorate of Weapons and Equipment, Reich Defence Ministry. 1 October 1931-1 October 1933: Major on Staff of the I. Battalion of Infantry Regiment 6. 1 October 1933-1 October 1934: Transferred to the Staff of the Fortress Command Glogau. 1 October 1934-1 March 1935: Transferred to the Staff of Border Defence Section Command Glogau. 1 March 1935-1 April 1935: Officer for Special Employment of the Chief of the Army Direction, then, Reich War Ministry and placed at the disposal of the Army Field Equipment Ministry. 1 April 1935-6 October 1936: Transferred to the Army Field Equipment Ministry. 6 October 1936-31 March 1937: Mortar Equipment Inspectorate. 31 March 1937-26 August 1939: Army Equipment Inspector B. 26 August 1939-1 April 1940: Commander of the Section Construction Staff Landau, later renamed Construction Staff 47. 1 April 1940-1 May 1941: Commandant of the Rhine Crossings. 1 May 1941-1 May 1942: Commander of Bridging Staff “Bruns” with Army Group North [engaged in Russia from 22 June 1941]. 1 May 1942-15 January 1943: Commandant of Troop Training Area Harskamp. 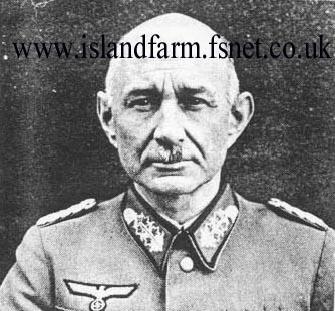 15 January 1943-24 January 1945: Commander of the Army Weapons Master School I. 24 January 1945-8 April 1945: Führer Reserve in the Army High Command. 8 April 1945-21 February 1948: Prisoner of war in British captivity. NOTE: Bruns' World War II decorations, if any, are not known. However, he was not a recipient of any high decorations such as the Knight's Cross of the Iron Cross, Knight's Cross of the War Merit Cross with Swords, or the German Cross in Gold/Silver. It is probable he received the 1939 Bars to his World War I Prussian Iron Crosses. The POW, in the photo below, bears an uncanny resemblance to Walter Bruns, but unfortunately, this can't be confirmed. 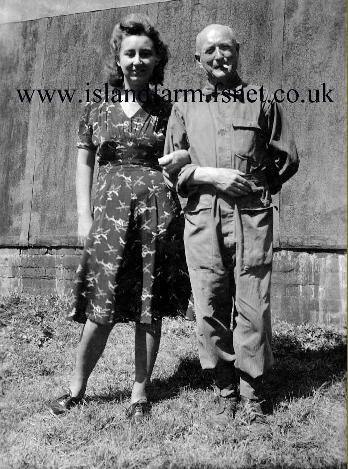 However if it was, then it would serve as further supporting evidence that this officer was definitely a POW at Island Farm.